Navien gas combi boilers from the NCB series, as the most advanced boilers from this manufacturer, are designed for the potable water and space heating, which includes hydronic, radiant floor, and air handlers. Check out the best features, advantages, and benefits for the homeowners. 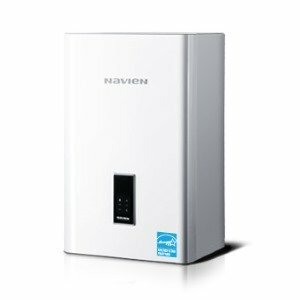 Navien NCB models utilize on-demand or tankless, and condensing technology resulting in continuous water heating with the ultra-high energy efficiency for great savings and low environmental impact. There are three powerful models available for homeowners; NCB-180, NCB-210, and NCB-240, all designed for the residential applications and whole-house use, but only in closed loop heating systems. Built with the condensing technology these Navien models come not only with one, but three heat exchangers, all made of the durable stainless steel, resistant to corrosion and covered with the 10-year warranty against leaking. With the approximate size of 17” x 28” x 12” and the maximum weight of up to 84 pounds, Navien NCB boilers are ideal for the wall mount, either in new or old systems (as the retrofit), easily replacing the standard tank-type models, and saving the floor space for other use. And, due to the forced draft direct vent design and its sealed combustion chamber, these boilers can be safely installed inside the house, while using the outside air for combustion. The multi-purpose design of the Navien NCB models provide enough heat for larger homes while supplying hot water for up to three applications at the same time, even more, if the cascade link is used. This cascade capability allows up to 15 condensing boilers to be linked into one system. Navien NCB boilers are equipped with the strong and environment-friendly premix gas burners, which have the maximum gas inputs of 150,000 BTU, 180,000 BTU and 199,900 BTU (depending on the model), including the option for modulation which further reduces the power to its minimum power of 14,000 BTU. Such a quality and gas-saving burners, with the condensing technology and recycled exhaust gases, result in significant reduction in pollution and great increase of the energy factor to the value of 0.99. Due to the condensing technology, products of combustion have the lower exhaust temperature so the unit can use PVC, CPVC and PP venting, which results in lower costs, faster and easier installation than the stainless steel vents, found on conventional tankless water heaters. The maximum vent length is up to 150’, with the 2” and 3” in diameter and using two-pipe configuration. The vent termination can be horizontal and vertical through the roof, providing more flexibility in installation. NCB models are factory built to use natural gas, but can also be converted to use LP (propane) gas, due to the installed dual venture system and low gas pressure operation. The Navien gas conversion kit is supplied with the boiler (it also includes the orifice for easy field conversion). The NCB models also come with the built-in domestic hot water flow restrictor but if the further flow restriction is needed, three different ones are also provided for different water flow rate. Other advanced features include the gas flow control system that helps in reducing the energy waste and unnecessary unit operation, a computerized control panel that provides the basic information, allows easy temperature change and the display of the error diagnostics. See the reviews and prices of Navien on Amazon.com. The control panel allows the temperature change from 86 F to 140 F in DHW mode and from 77 F to 194 F in hydronic heating mode. The electronic board as the “brain” of the boiler ensures safe and reliable operation, constantly “watching” operating parameters and protective elements such as different temperature, pressure, and operating sensors, for safety.